I know is it’s time to hop on a bus and kick the season off. I am not chomping at the bit saying, time to go hit another color jersey, as lots of my fellow coaches are probably saying. I jumped that shark ten years ago. A scrimmage, to me, is about evaluating and being smart. It’s not a time to go crazy and get all jacked up. In fact, I don’t like scrimmages. Period. The. End. I spend more time worrying about scrimmages and its format and our player rotation than I do enjoying seeing us back on the field. It’s a scrimmage. Nobody wins. And if you do keep score, you are missing the point. Scrimmages are just a tool to evaluate. Nothing more, nothing less. So, no. I’m not sitting here all crazed ready to go scrimmage. I am measured, which I think best fits the way you need to approach phony games in mid-August. There is more to lose in a scrimmage than there is to gain. That’s my opinion, my belief. I’m not speaking for other coaches. This is just me. I do not sugarcoat and I sure as hell will not throw out cliches. I’m ready. We are ready. It’s been a good two weeks. Tomorrow we get to go against someone else. We will come home, watch film and get ready for another scrimmage next week. That’s it. There is nothing to be excited about. We have a lot of things to do and get done leading up to when it counts on Sept. 1.
attitude. We will play the game the right away. Then we will go home and get back to work on Saturday morning. That’s what we do. That’s what we will always do. After our least impressive performance of the young season on Tuesday, we came back and had a good one one Wednesday. Why? Because that’s what needed to happen. The kids responded. They always do. This group of kids is great. They are fun to be around. They have the right attitude. I didn’t panic and in time they didn’t panic. Bad days happen. Yes, even in football. People have bad days, that is life. That is football. We survived. Now we are moving on. The clock is ticking. Tomorrow night around 9:00 p.m. you are guaranteed no more than 11 weeks left of the football season. It’s goes by in a blink. We talked about this today. It’s go time. There is no next season for you. It has to happen now. Make this a great one! FIO! -The Jags ran a fade on 4th & G from the 1 yard line. -Yankees are 10 games over .500. -Can’t wait for hockey season. -Thought of the day: don’t waste other people’s time. Good grief. Common sense? -Big Ten football will be the best in the country again this year. coaches all over the United States. -My bulldog just burped and walked away from me. Time to close this blog out. Until after the Sweetwater scrimmage…FIO. 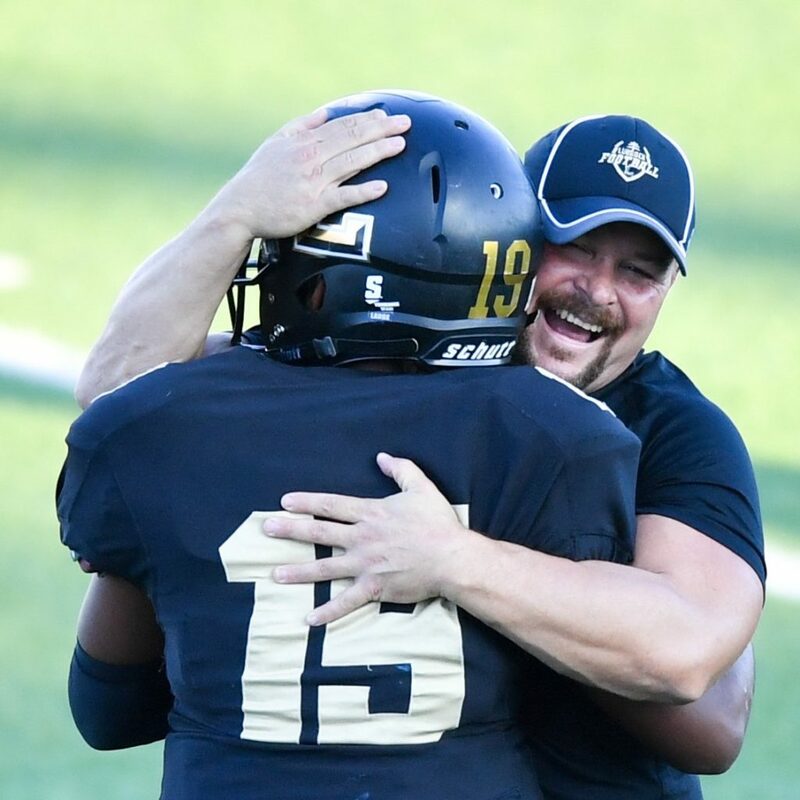 Lubbock head coach Jason Strunk celebrates after Lake View win in 2016 with quarterback Kwami Wilborn. Photo courtesy of Lubbock Avalanche-Journal.